NARRATOR: During the summer of 1940 Sugihara was preparing to close his consulate and report to the Japanese embassy in Berlin for reassignment. He believed his work in Kaunas was over ... until the morning of July 27. SUGIHARA (QUOTE): I opened my bedroom window in the morning and there they were — about two hundred of them I guess, surrounding the house. We had no idea who they were. NARRATOR: An unruly crowd of Jewish refugees with Curaçao visas was outside begging to see the Japanese consul. YUKIKO SUGIHARA: There were children, women, and young men. They were all hanging onto the fence. The young men were trying to climb over the fence, but the security of the consulate was pushing them back. NARRATOR: Sugihara asked the crowd to send in five representatives to state their case. Inside, the men requested transit visas and told Sugihara he was their last hope. Zorach Warhaftig led the group. Samuel Graudenz was his secretary. GRAUDENZ: We discussed the matter with him and he had his, at first his doubts whether he can do it — because he would have to get the permission of his government. SUGIHARA (QUOTE): They explained what had happened in their hometowns with the Germans. Poland had been bombed and occupied. I wanted to issue the visas, but I didn't know how I was going to do it. I had to wire the home office for instructions. NARRATOR: Sugihara cabled back to the Foreign Ministry in Tokyo. In his letter he described the mounting problems in Kaunas and asked permission to issue the visas. But the request was denied. The Ministry insisted that visas could only be issued if Sugihara followed strict guidelines. The refugees must have a valid end visa and they must have enough money to cover their travel expenses. Sugihara now doubted the legitimacy of these Curaçao visas and knew that most of the refugees had no money. Clearly, issuing visas for them would be a flagrant violation of the rules. Over the next few days, Sugihara cabled back several times with visa requests... but the approval never came. Meanwhile, the crowds continued to build. YUKIKO SUGIHARA: I wasn't frightened by the crowd. They all looked so sad. Some women were looking right at me with great sorrow. Some of them had their hands together begging. I could see how they came there depending on us. YUKIKO SUGIHARA: If we were in Germany and we did something like that, my husband, myself, my children could all be taken away by the Nazis. I didn't know what they would do to us ... maybe they'd kill us. 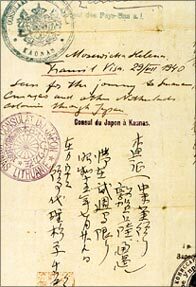 Many had to be handwritten in the complex characters of Japanese. When he checked the refugees' paperwork, he found that many were missing essential documents. SUGIHARA (QUOTE): I'd say more than half of them had no passport. Under the conditions they had to deal with when they left their homeland it seemed understandable... So we accepted anything... even blank sheets of paper with "Curaçao — no visa required" handwritten as a destination. NARRATOR: Some refugees, like Susan Bluman and her husband had no Curaçao visas at all... but still received a transit visa from Sugihara. BLUMAN: My husband went to Chiune Sugihara asking for a visa, but we didn't have any other visa on it really, but somehow Sugihara gave us the visa. He was just doing from the bottom of his heart ... it was wonderful. NARRATOR: Working 16 hours a day, Sugihara became obsessed with his mission. He even requested an extension on his stay in Kaunas so he could continue his life-saving work. Moses Zupnik came to Sugihara, with his Curaçao visas in hand, requesting 300 transit visas for the Mir Yeshiva. ZUPNIK: I came in, I was all excited, and I saw that he measured me. He was sitting at his desk and measuring me from top to bottom, who I am, what I am. I said to him, "I am a representative of the Mir Yeshiva, we want to go to Curaçao, we just want to go through Japan." NARRATOR: Zupnik nervously awaited the response. To his surprise, Sugihara agreed to write all the visas. ZUPNIK: I still remember when he looked at me, when he said to me, "All right, I'll give you the visas," I don't forget those things because they're still, they're still all alive in me. He saw people suffering and he thought maybe he could help, and he helped. NARRATOR: Zupnik returned several days later to pick up the visas, but he found Sugihara's assistant, Wolfgang Gudze, in a panic over the ever-growing volume of requests. ZUPNIK: So I came in the morning, I see Wolfgang Gudze is all excited and tells the consul "How could I handle a thousand visas? The people are standing outside in line, how could I handle it?" I heard it, so I said to Gudze, "You know what? I will help you." He went over to Sugihara, said "He wants to help me." He looked at me... "Let him help you." NARRATOR: For the next two weeks Zupnik sat with Gudze stamping passports for Sugihara. But finally, the Russians insisted that the Japanese consulate close. Sugihara and his family began packing their belongings ... while Moses Zupnik prepared for his journey to Japan. Wolfgang Gudze was of German descent, so he reluctantly headed to Germany to join Hitler's army. ZUPNIK: When I left the consul it was very interesting and I said, "Wolfgang, how could I thank you?" He parted with me with those words which I still remember. "You don't have to thank me. But the world is a wheel, in German called a rad. I mean, a wheel, you know what a wheel is." I say "Yeah, a wheel." "Today Hitler is on top. Tomorrow he might be down. Don't forget what I did for you." NARRATOR: Zupnik never heard from Gudze again. In early September, after writing more than 2,000 transit visas Sugihara prepared to leave for Berlin. YUKIKO SUGIHARA: He was so exhausted, like a sick person. Even though he was ordered to go to Berlin, he said he couldn't make it to Berlin and suggested we go to a hotel and rest before leaving. When we got to the hotel, the Jewish people came looking for us there. So he wrote some more visas in the hotel. The next day when we got to the train station, they were there too. So he wrote more visas on the platform until the train left. Once we were on board, they were hanging on the windows and he wrote some more. When the train started moving, he couldn't write any more. Everyone was waving their hands. One of them called out, "Thank you Mr. Sugihara, we will come to see you again," and he came running after the train. I couldn't stop crying. When I think about it even now I can't help crying. A hand-written transit visa permitting travel through Japan, issued by Sugihara in Kaunas, dated 29/VIII, 1940. 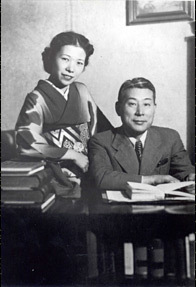 Yukiko and Chiune Sugihara, at the consulate in Kaunas, circa 1939 - 1940.